The Campaign Logger helps you capture all the details you make up during sessions for the length of your entire campaign. Our unique and fast tagging system makes the software automagically slice and dice your session notes into a database of NPCs, locations, plots, items, and more. This means you have a dynamic cast of characters, inventory, and gazetteer for your campaign. And, the best part? You can rapidly search, filter, and scan session notes so you can see who did what where and when at any time. And your campaign stays consistent because you can scan and read past session notes anytime. You'll be the most organized game master you've ever been! After logging in, on the main screen, enter your campaign name in the empty box. Then click the "Create new log" button to create your campaign's log. Create as many campaigns as you want this way. On the main screen, you can change your campaign log's name anytime. Click the pencil icon. To delete a campaign log, click the trash can icon. To export your campaign log, click the export icon. You can export to plain text and JSON format. You are in full control because you can save your campaign logs as often as you like to make backups. To backup a campaign log, from the campaign logs main screen click the download icon. Select JSON format and save. To restore a backup, click the import icon from the campaign log listings main screen. Select the JSON file to restore. This will create a new campaign log. Rename it as desired. Delete the old version if you do not want a copy kept in the logger. Note: It can take a minute for all logs to populate after restore. Please wait and reload the campaign log if you do not see your log entries right away. Logs on Windows, Android, and Web use an identical file structure. we did this so you could manually synch logs between your computers and devices, if desired. To manually synch a specific campaign log, export the log on one computer or device as a JSON file. Use a file sharing service like Dropbox or Box to get the JSON file to your destination device. Another option is emailing the file to yourself and saving it on your destination device from there. Then open Campaign Logger on your destination device and import the JSON file from the main screen. Manually synching this way takes just moments. And it lets you take session notes on one device or computer, and then work with them between games on another. You can add up to 2,500 characters to each log entry, including tags and spaces. Click the checkmark icon to save a log entry, or just hit the Enter key. Type your session notes into the log entry box. 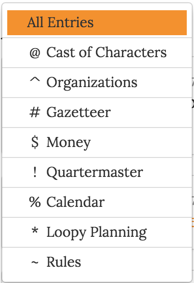 Type a tag symbol before each keyword or word you want to make into linked entry in the Campaign Logger database. ASCII is supported, and there is Unicode support for tags for non-ASCII letters and digits. This means the logger supports Arabian, Cyrillic, Chinese, etc. To turn multiple words into tags, uses double quotes after the tag symbol. Typing long names and words with tricky spellings is a pain. So we added autocomplete. Just start typing and quickly select the word you need. This not only makes session notes faster to take, but it makes spelling of everything in your logs consistent. Paste in http URLs to any web page you want. The Campaign Logger will make the link clickable and open the link in a new tab or window. Use the drop-down tag menu to filter log entries by tag type. Use the search box to find any logs with that text.